Capable to Holding Screw without help of your fingers! Unique, Superior Fitting not found in any other types of screwdrivers. GiGa FIT Screwdriver tip is precisely formed to fit and hold the Phillips screw. GiGa FiT Screwdriver offers the most precise fit on the market and superior ease of use allowing you to work with one hand instead of two hands (All other manufacturers screwdrivers require holding the screw with one hand and inserting the screwdriver with another hand). Working with this Superior Screwdriver makes work 80% more efficient and much easier. The Revolutionary tip has been patented by Tokoma. Place a Screw on the tip of the GiGa FiT driver. Strike the tip of the screw on a hard surface from about 5cm (1/4") height. Giga Fits Flat Heat drivers are design to stay in the center of the screw. 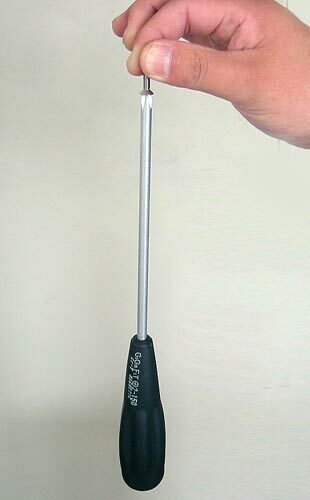 You no longer need to use your other hand to hold the screwdriver at the center of the screw. It is almost like you were using Philips head screwdriver and screws.